What a wonderful world we live in that I can just google Brea + food trucks and come up with a truck just 5 minutes from my hotel. 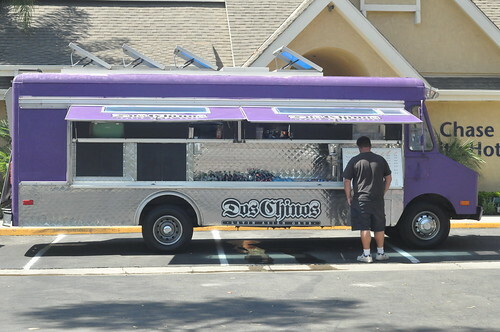 Apparently Dos Chinos, an Asian-Mexican fusion truck, parked near where I was staying on Friday. Score! 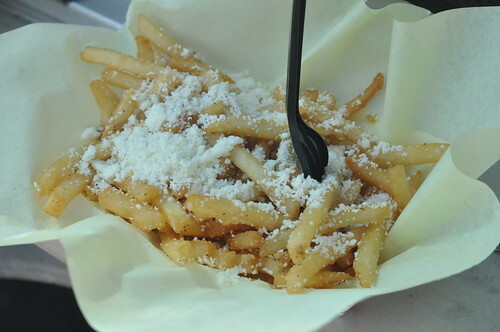 Previewing their menu online, I knew that I HAD to get the garlic fries with cotija cheese. And they were certifiably AWESOME. These were the hands down best garlic fries I've ever had it my life. They were super garlicky. Super crispy. And the cotija adds just the right touch of saltiness. The tacos were great, too. Korean tacos have made some serious inroads in the NYC food truck scene, but these tacos were a pan-Asian sort of fusion. I chose the BOLSA ROAST PORK, a Vietnamese roast pork belly and the HOLLYWOOD CHICKEN, a thai coconut curry chicken. Really unique combos. They weren't anything that I would imagine on a taco, but the flavors worked. Delicious! 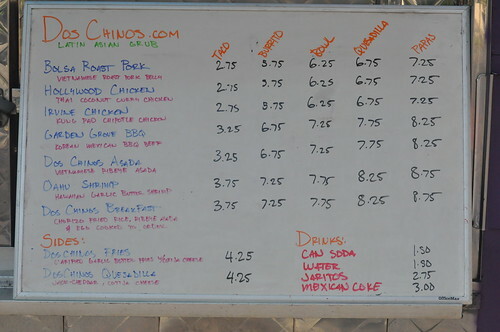 If you're in the OC, seek out Dos Chinos and please, please(!) get some garlic fries for me. What are the odds that I get to have spot a food truck from truck auctions in Perth? I'm planning to sell burritos-on-a-wheel and these ideas seem great, too!